If you haven't guessed by the name of my blog, I am a tea junkie (and an aspiring tea tester,haha). I will drink any type of tea going as long as it is in a large (and by large, I mean large) mug and made to perfection. The herbals teas that I tend to pick up are by Twinings as I find that they seem to have much more of a selection readily available in supermarkets than any other brand. 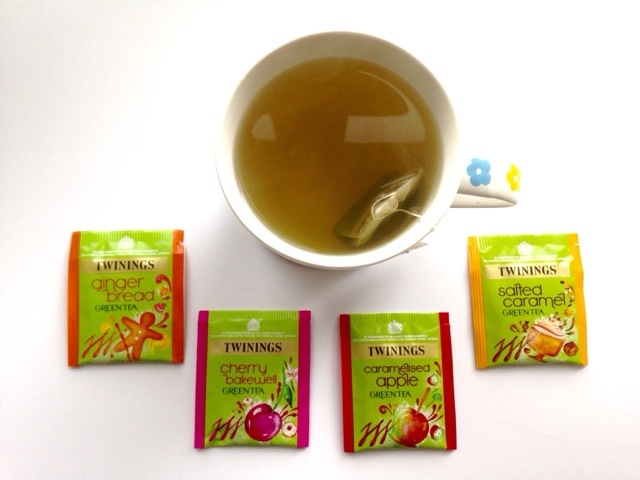 My current favourite tea from Twinings form part of their indulgent green tea selection: Caramelised Apple, Salted Caramel, Cherry Bakewell and Gingerbread. All 4 of these teas taste incredible and I have repurchased all of them at some point. I have also just noticed on their website that they now do a fudge melt version which I will now need to locate asap. I'm also a big fan of tea and green has been my go to tea for years. I haven't tried these before, but they sound amazing! I may have to pop to the shop tomorrow to scout them out! These look amazing! I absolutely have to try the Caramelized Apple and the Salted Caramel. I think I'll go look for them today! Ohhhh, yum! I'm not usually a fan of green tea (I find it tastes metallic.. Is that weird?) but I really like that salted caramel one and wasn't aware they did more in the same range. Definitely going to have to track these down now!